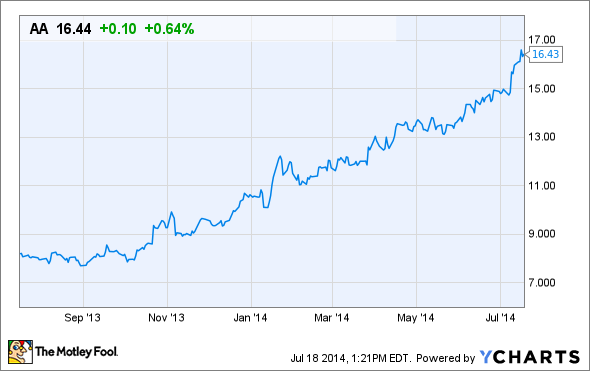 Alcoa has doubled in value in less than a year. What's behind this huge rally? The recent news of Alcoa's agreement to acquire Firth Rixson for nearly $3 billion is a clear sign that indicates the direction the company is heading: aerospace. As has been stated by the company before, Alcoa's intention is to reduce its exposure to the volatile low-margin aluminum business and move toward the more steady, high-margin aerospace industry. Adding this leader in jet engine components accelerates the realization of this goal. Market-wise, Firth Rixson is very strong in some key components for the industry, like rings and engine forgings, but outside aerospace, the company supplies parts for industrial gas turbines and landing gears. The potential is enormous. Why? The aerospace industry is more and more focused on developing more fuel-efficient plane engines as well as reducing emissions, and here is where light, high-quality aluminum parts play a crucial role. Soon, Alcoa will be able to expand its existing aerospace business, adding significant cost savings and synergies that will reach $100 million per annum by 2019. Firth Rixson sales alone are expected to grow at a compounded annual growth rate of 12% in five years, and the cool thing is that 70% of this growth is already secured through long-term agreements. Despite the fact that upstream remains the most significant business for Alcoa -- and it continues to improve for the eleventh consecutive quarter -- value-added manufacturers continue to grow in importance. The company remains the world's leading producer of primary and fabricated aluminum, as well as the world's largest miner of bauxite and refiner of alumina. But within Alcoa's value-added businesses, aerospace is the largest contributor, comprising 57% of overall revenues last year, and 80% of segment profits. Plus, the company is the undisputed leader in aluminum forgings and extrusions, jet engine airfoils, and fastening systems. With the new deal in place, Alcoa's aerospace revenues will grow by one fifth to around $4.8 billion. Impressive. A shift toward fabrication is a promise Alcoa has been making to investors for years, but until now, it wasn't reflected in its financial results. Not only the company's price rally, but the recent presentation of its second-quarter results show that this transformation strategy is working. All of Alcoa's business segments were profitable during the quarter, but its downstream business achieved its best ever results, delivering $204 million in after-tax operating income. And this doesn't include the Firth Rixson deal! Alcoa's stronger focus on the downstream business is becoming a reality, and it is consistently being shown in the company's results. Soon, with Firth Rixson, Alcoa will be able to add high-growth value-adding engine components to its business, beating the industry's growth. Plus, it will reduce its relative exposure to its swinging upstream operations, which despite their good performance might bring headaches looking ahead if aluminum prices drop significantly.